To make theme working in your language or create multilingual website, please install AIT Languages plugin which will activate this feature. Please follow as bellow. 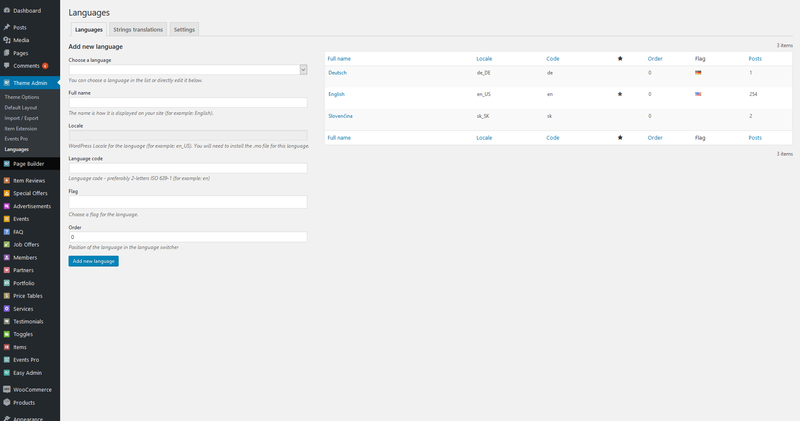 All our new multilingual WordPress themes comes with built-in support for multilingual management. You can create website in your native language or create multilingual website where all parts of AIT theme and plugins are already translated. AIT Languages plugin is available for download under your AIT Themes Club account, after login in our system. Please download zip file and install the plugin in a standard WordPress way using downloaded zip package. In Plugins options screen click on Add New and Upload Plugin button. Next screen will ask you upload zip file with plugin. Select zip file and activated it. In case you have purchased Multilingual Theme bundle or Business/Premium Membership you can install plugin via AIT Updater plugin. For more information related to AIT Languages functionality follow up related pages available in Multilingual Options section of general Documentation page.